TwoMindsFull: A Brand New Venture! TiffiBag—we did it just like Tiffan”I” did in Gotta Keep on Tryin'—scouting for funky-cool remnants and having totes made to accompany us everywhere— evening, church, brunch, or book club meeting! The Tiffi size we’ve started with is big enough for a book, your water, a snack—maybe for two. . . Small enough to tuck in your purse for whatever comes your way. 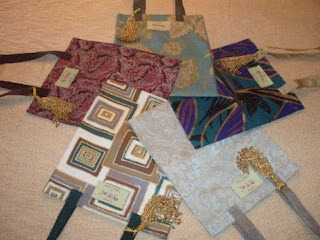 All the fabrics are limited editions--so when it's gone, it's gone! Sure you’ve got bags from work, conferences and conventions but Tiffani Alexander thought you might like a bag that says a little more—about you. A tote bag with style. A tote bag with sophistication. A tote bag like no other. A bag made to go with you everywhere looking good matters. Each Original TiffiBag measures approximately 11” x 13” and is hand crafted from an array of beautiful, limited edition, upholstery quality fabrics and each is embellished with an imported, handmade, glass beaded tassel—because you know Tiffani likes a little sparkle and flash. Here’s a preview but please visit our website for prices, individual photos and descriptions! !